Sally, Annie, Julie and Billy didn't know what to do. Each of them sat in the grass pouting. “I'm bored,” Julie said. “What sort of game?” Billy lifted his head and looked at his friends. “What did Hansel and Gretel do? How do we play it?” Billy stood. “We go deep into the woods and pretend we're lost. We have to take bread and leave a trail so we can find our way back,” Annie said. “That doesn't sound fun,” Sally said. “Witch? 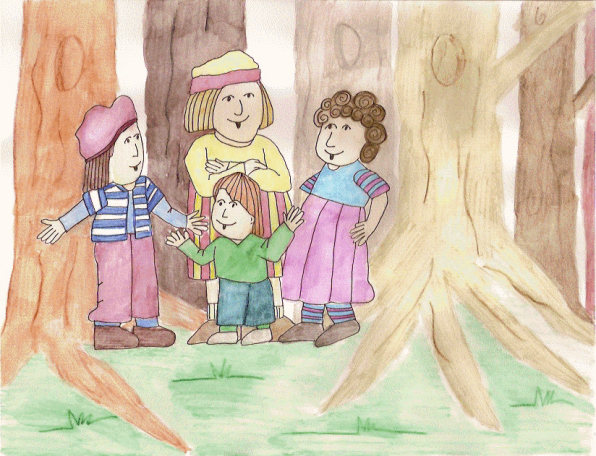 Is there a witch in the woods?” Sally, the youngest, didn't think Annie was teasing. “She lives in a house made of cookies and candy and cake. We have to make sure we don't nibble on them and she'll leave us alone.” Annie enjoyed frightening Sally. Billy and Julie ran off and came back a few minutes later, their pockets bulging with bread. Off they went, deep into the forest. Even though it was the middle of the day, the trees hid a lot of the sunlight and it seemed darker to the children. Each of them dropped their bread bits. What they didn't know was that three birds followed behind them eating every piece of bread they left. They hid, peeking from behind the trees. Suddenly a loud screech came from inside the cottage. Annie and her friends went outside and sat on the steps. The others agreed and never again did they play Hansel and Gretel.